Former World Cup champions attend youth tournament in Moscow. A countdown clock to the start of the World Cup 2018 was officially launched in the center of Moscow on September 18. Igor Akinfeev and Alexander Kerzhakov, players from Russia’s national team, attended the ceremony. The date was not random – exactly 1,000 days remain to the beginning of the World Cup. 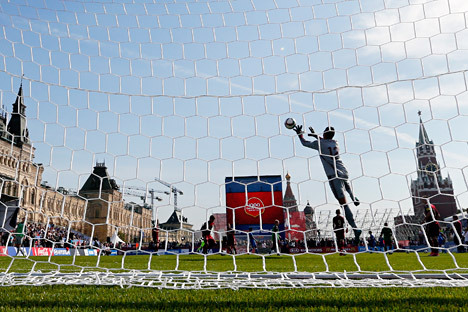 A football field was constructed on Red Square where youth teams from Germany, Italy and Spain – the countries that won the last three world championships – competed. The Russian national team was in attendance as representatives of the World Cup's host country. Honored guests of the tournament included Lothar Matthaus, Gianluca Zambrotta – both World Cup champions – as well as Fernando Hierro, the famed Spanish footballer who appeared on four World Cup teams.